looks like i posted that hat pattern just in time – because here’s even more to celebrate! ben stumbled across this today here while i was taking a nap. I like your book cover. I think I will have to get it once it comes out to support a new Pittsburgher. It looks great, you must feel so proud! sending lots of proud, smiley vibes. Very cool. How much did you have to do with the design of the cover? The cover looks great. What is the object holding the hat? Wow love the hat but I want the hat stahd, is it yours? Congratulations, I’m heading to Chapters today, I’ll look & see if it’s available up here yet. Woo hoo! Lovely! Can’t wait till it comes out, it’s on my list! Congratulations! That is soooo exciting!!! It looks great! That is so much fun that you’re getting to do this. Congratulations! Saw this on Flickr and just had to say again how awesome the cover is! I love the fonts used, and it is something I would definitely grab off the shelf for myself! Hey Cosy, the cover looks great! I’m so excited for you. Can’t wait until the book is available. I’ll have to keep an eye out for it once the release date hits. 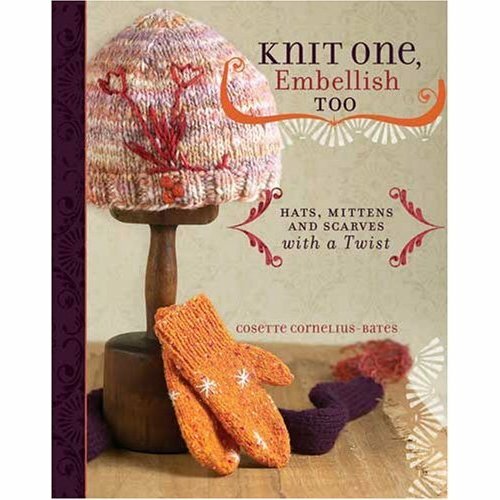 Maybe I can convince my LYS to special-order me a copy, if they don’t get one in their regular book order. Congrats!! I cannot wait until it’s available!! It looks fabulous!